We've taken an in-depth and thorough look at the iPad, but we wanted to spend a little time with some of Apple's official accessories the company handed out with review units. There's nothing crazy here, but we did make some interesting observations about add-ons for the iPad, so join us for a phantasmagorical peek inside the world of fantabulous tablet accessamifyin'. Okay, we'll level with you. It's a dock. For your iPad. It charges, let's you easily slip things into slideshow mode, and also has an audio out jack, for, you know... audio outing. Standard fare if you've ever seen an Apple dock. Now this one is kind of interesting. You seat your iPad (unfortunately portrait only) and immediately have what feels like a traditional laptop. You get some added perks with the keyboard, such as controls for brightness, volume, a dedicated home key, lock key, iPod controls, and ironically... a button to bring up the keyboard. There's also a slideshow key, search key, and lock key, making the utility of the dock much clearer. Oh, and then there's the little matter of being able to type on a physical Apple keyboard, which are typically pretty darn good. 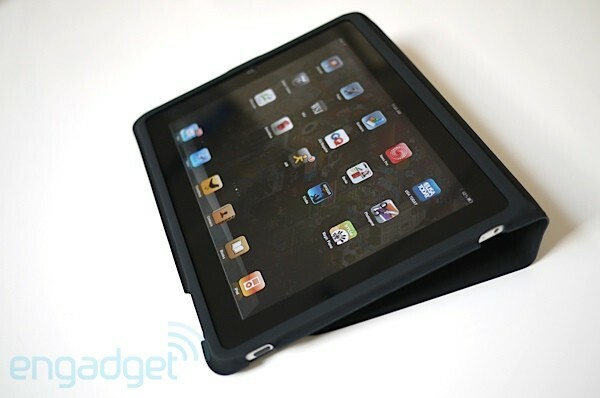 If you're planning to really try and make an iPad your getting-things-done machine, you'll definitely want this. Our one complaint? It's not that easy to interact with the touchscreen from this angle. Maybe we just need an official Apple Fing-Longer. Hey, we know what you're thinking. 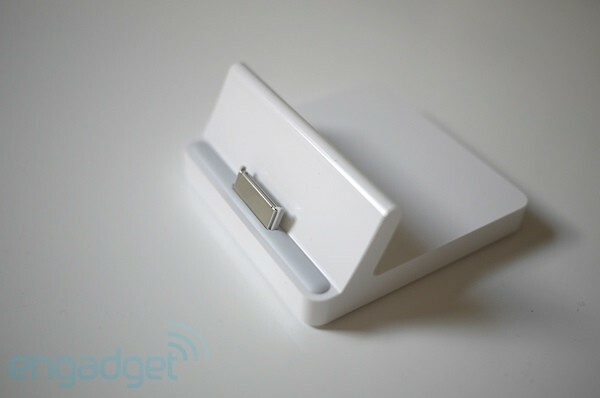 "C'mon Engadget, that's just a case -- stop jerking my chain!" But wait, there's more. It's not just a case fellas, it's also a stand for when you want to go into slideshow mode, a prop for keeping the iPad on an angle for easier typing in landscape mode, and you know... it's a case. We're not really big fans of the styling (it's a little Matrix-y for us), but the idea is sound. Still, we're a little more psyched on something like this M-Edge Moleskine-styled case. But hey, to each his own. 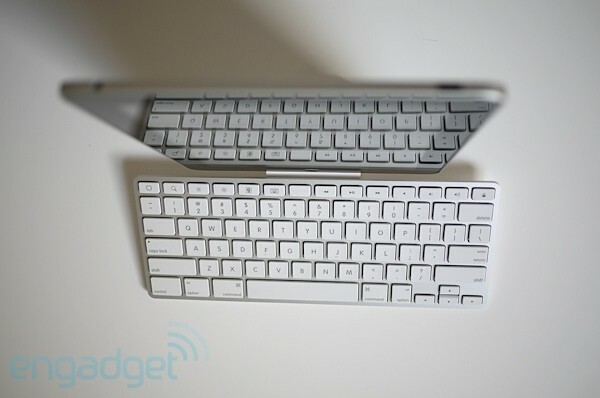 As you may know, you can actually pair your Bluetooth keyboard with the iPad, thus giving you a chance to type out angry resignation letters from anywhere within 60 feet of your device. Nilay Patel learned this the hard way when he decided to pen his resignation letter on his new toy. Of course, we can't let him out of his contract... since he signed it in blood and owes us his soul. Hear the man moments before we broke the news to him in the video above, as he pairs his iPad and keyboard in blissful ignorance of his pact with the devil. An interesting sidenote -- once you pair your devices, you can no longer bring up the on-screen keyboard, potentially leaving you high and dry if you walk away without unpairing your junk.